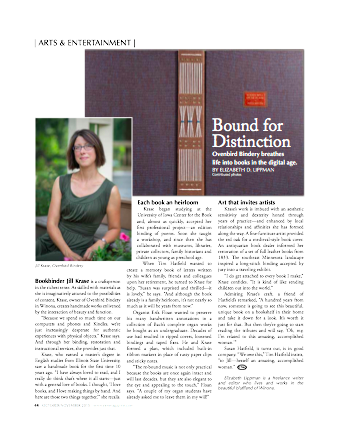 "Bound for Distinction: Ovenbird Bindery breathes life into books in the digital age"
Bookbinder Jill Krase is a craftsperson in the richest sense. As skilled with materials as she is imaginatively attuned to the possibilities of content, Krase, owner of Ovenbird Bindery in Winona, creates handmade works enlivened by the interaction of beauty and function. “Because we spend so much time on our computers and phones and Kindles, we’re just increasingly desperate for authentic experiences with physical objects,” Krase says. And through her binding, restoration and instructional services, she provides just that. Krase, who earned a master’s degree in English studies from Illinois State University, saw a handmade book for the first time 10 years ago. “I have always loved to read, and I really do think that’s where it all starts—just with a general love of books. I thought, ‘I love books, and I love making things by hand. And here are those two things together,’” she recalls. Krase began studying at the University of Iowa Center for the Book and, almost as quickly, accepted her first professional project—an edition binding of poems. Soon she taught a workshop, and since then she has collaborated with museums, libraries, private collectors, family historians and children as young as preschool age. Organist Erik Floan wanted to preserve his many handwritten annotations in a collection of Bach’s complete organ works he bought as an undergraduate. Decades of use had resulted in ripped covers, loosened bindings and taped fixes. He and Krase formed a plan, which included built-in ribbon markers in place of rusty paper clips and sticky notes. Krase’s work is imbued with an aesthetic sensitivity and dexterity honed through years of practice—and enhanced by local relationships and affinities she has formed along the way. A fine-furniture artist provided the red oak for a medieval-style book cover. An antiquarian book dealer informed her restoration of a set of full leather books from 1833. The southeast Minnesota landscape inspired a long-stitch binding accepted by jury into a traveling exhibit. Elizabeth Lippman is a freelance writer and editor who lives and works in the beautiful bluffland of Winona.